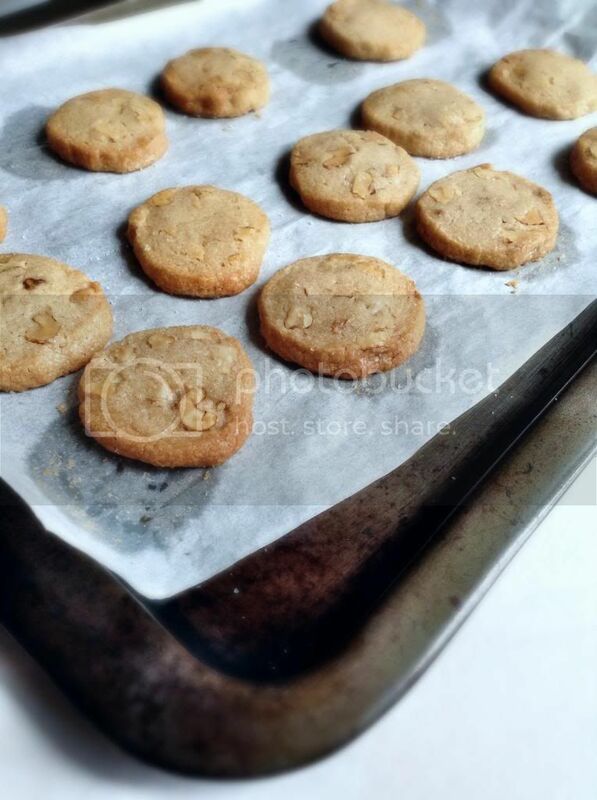 Crumbs and Cookies: espresso walnut shortbread cookies. I love Instagram. I really do. Part of the reason why I'm so addicted to it is because of the ease by which I can upload and share photos. There's no need to get out my DSLR, transfer the photos to my computer, upload them to Photobucket, edit them then post them on this blog in order for people to see. This convenience, however, has been turning on me recently. Sometimes I nearly forget that I have to take pictures for this blog, which I do with my DSLR. For most of my Instagram photos I simply use my iPad, and I think it greatly suffices for that avenue. You may notice a difference in today's photos - that's because they are taken with my iPad. It was only after I'd taken my last photo with the aforementioned technology and packed the cookies away safely in their container - and out of sight for good measure - that I remembered that I had yet to do the same with my DSLR. In the past I'd nearly forgotten, today I truly and regrettably did. But not wanting to go through all that trouble of setting up the table and all again, I decided to try using the photos I already had, just this once (don't berate me please). As I was editing the pictures on my computer I noticed that they simply just did not look as good here as they did on the smaller screen of my iPad. It could be because I'd viewed the pictures taken with my DSLR together with these, making the contrast all too apparent, but ultimately the reason why the DSLR is such a coveted tool cannot be denied. I admit that it broke my heart a little because this is the first time ever since I'd gotten my DSLR back in May 2011 that I did not used my camera for a blog post. At the very least, this experience has taught me that the every extra effort put in from using a proper camera is reflected in the final photo. It has also reminded me of how much joy I derive from it despite the hassle. These cookies have the faint aroma of coffee that pairs well with the nuttiness of the walnuts, and if you ever have the slightest inclination to, I strongly suggest that you add in some chocolate as well. I was trying to be virtuous and do away with the chocolate this time since I seem to almost always bake something containing chocolate but I have to say that I feel a tiny tinge of regret for not doing so. Chocolate or none though, these are cookies that will have you hugging the cookie jar tightly to your chest and never letting go. Beat the butter and sugars together until smooth. Beat in the vanilla and coffee extracts, then add the flour, mixing only until it disappears into the dough. Stir in the walnuts and chocolate chips, if using. Transfer the soft, sticky dough to a gallon-size zipper-lock plastic bag. Put the bag on a flat surface, leaving the top open, and roll the dough into a 9 x 10 1/2 inch rectangle that's 1/4 inch thick. As you roll, turn the bag occasionally and lift the plastic from the dough so that it doesn't cause creases. When you get the right size and thickness, seal the bag, pressing out as much air as possible, and refrigerate the dough for at least 2 hours, or for up to 2 days. Put the plastic bag on a cutting board and slit it open. Turn the firm dough out onto the board (discard the bag) and, using a ruler as a guide and a sharp knife, cut the dough into 1 1/2 inch squares. 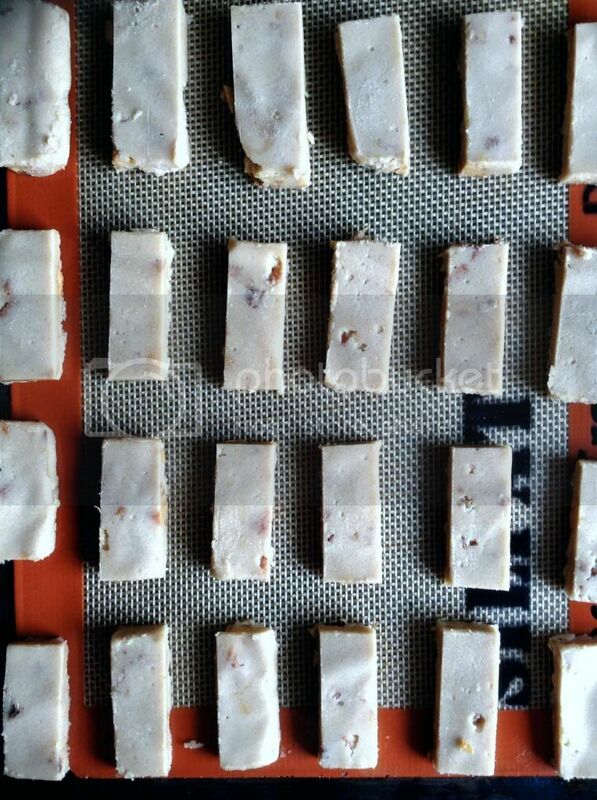 Transfer the squares to the baking sheets and carefully prick each one twice with a fork. Bake for about 16 minutes. Try not to let the shortbreads color too much. Looks so yummy! 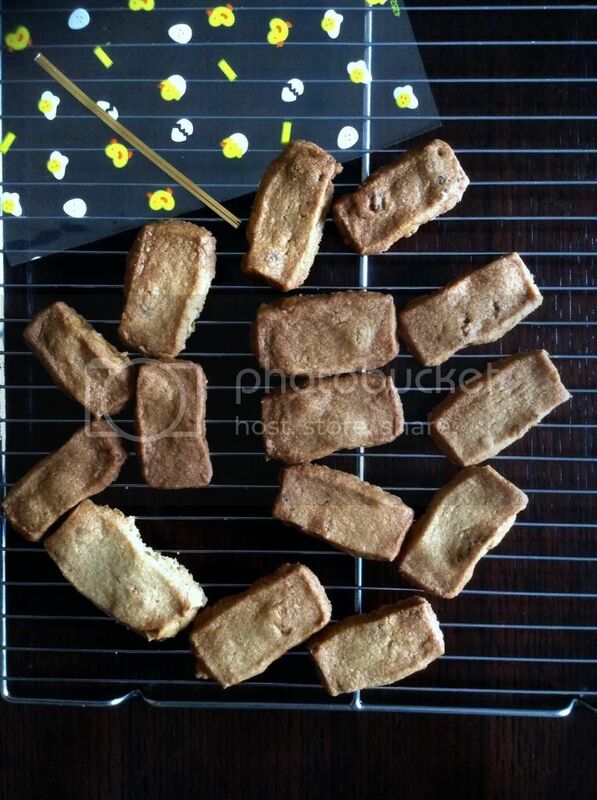 If I wanna bake plain shortbread butter cookies, I need only flour, sugar, butter n vanilla essence right?